To purchase bulk coffee from home, visit our online store! Orders typically ship next business day! 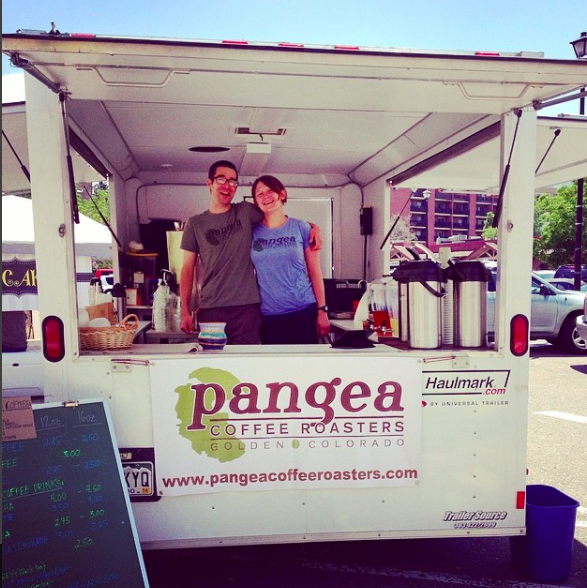 Pangea Coffee Roasters was founded in 2013 by couple Matt Kurgan and Amanda Krenn. After working in the coffee industry for a combined 15 years, (how they actually met!) the two decided to jump into the coffee business for themselves. The perfect opportunity arose in 2013 in Golden, CO where the two leased a small warehouse to roast on a Diedrich IR-3. They quickly picked up a few wholesale accounts and operated a small coffee truck at local events and farmers markets to promote their coffee. The small venture quickly grew and brought Pangea Coffee Roasters to a retail establishment in Downtown Golden in 2015. The duo looks forward to growing the company in Golden, CO where it started and continue to evolve in the specialty coffee industry. When the two are not at the shop roasting or preparing drinks (which is a lot!) they are out enjoying beautiful Colorado. Matt and Amanda love to bike, hike, and camp. The outdoor lifestyle is what drew them to Colorado over 10 years ago. You can also find them trying out all the other coffee roasters Colorado has to offer or hitting up one of the many fine restaurants or micro breweries the state has to offer. We offer coffee in larger wholesale packaging suitable for restaurants, cafes, and work places. Our coffee is also available in retail packaging for the shelves of your business. Contact us today for more information on our wholesale program. We also offer catering for any size event. Whether it's a wedding, office party, or birthday party, we can provide large amounts of brewed coffee to accommodate any of your needs. Contact us today to receive a quote for your event. Visit our Retail Location with a full espresso bar, bulk coffee, pour overs, retail items, and pastries.